Toronto Life Series: Where to buy now, Part 3 – "I KNOW TORONTO!" 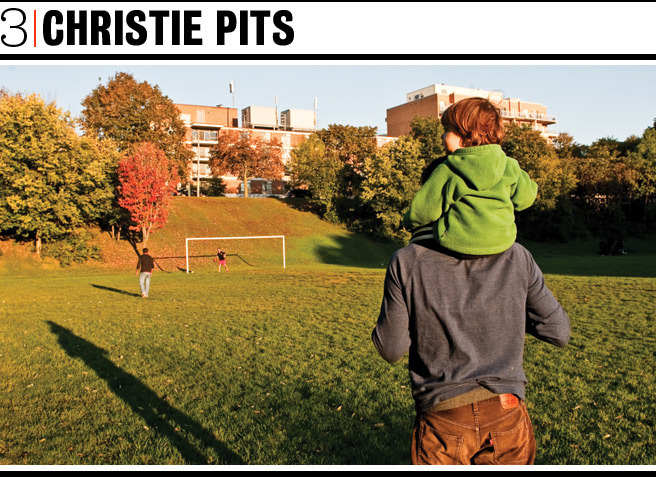 Plagued by crime and patrolled by drug dealers, Christie Pits’s green spaces seemed doomed—until fed-up neighbours did something about it. Angela Burns, who’s lived in the area since the ’70s, founded the Christie-Ossington (now the Christie Pits) Residents’ Association in 2006. One of the group’s early campaigns was a cleanup of Irene Parkette, off Shaw Street. Burns convinced fellow residents that they would have to use the park or lose it to the dealers. They organized picnics, cleared trash, installed new playground equipment and convinced police to patrol the space during periods of high activity. Within a year, the park was littered with sandbox toys, and toddlers had taken over the playground.